One of our favorite events to help with is weddings! Each couple has their own unique dream for their special day, and it is such a pleasure to help make these dreams a reality. Recently, we set up an open-air photo booth at the wedding of our clients, Ashley and Michael. 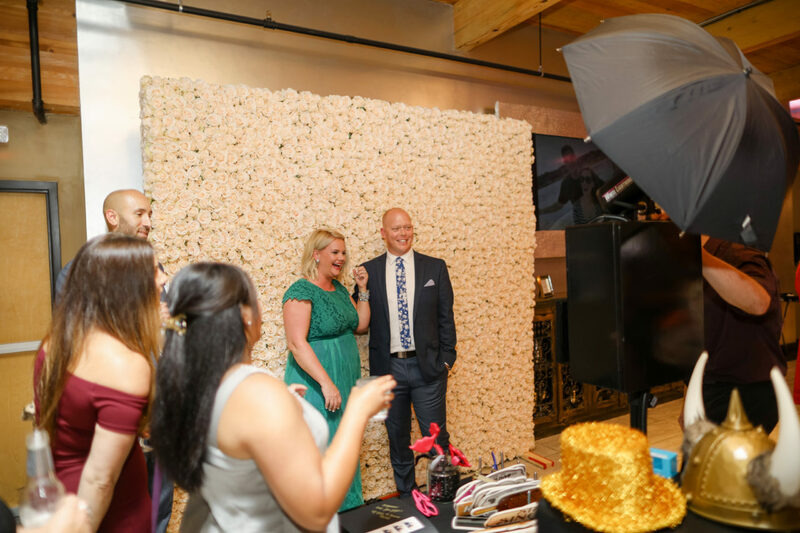 Ashley and Michael settled on an open-air style photo booth – their wedding, which is our modern take on the classic mall photo booth. It was a really great way to capture the events. 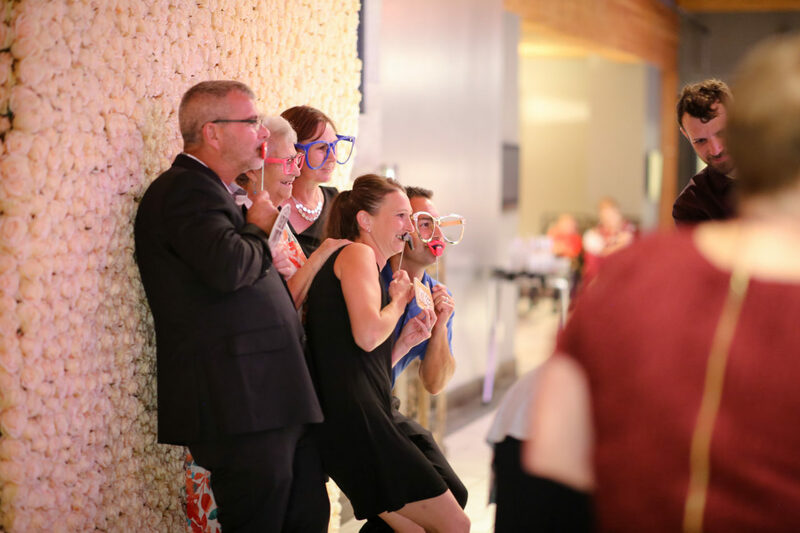 With a photo booth, the guests get to have fun and be silly in front of the camera. 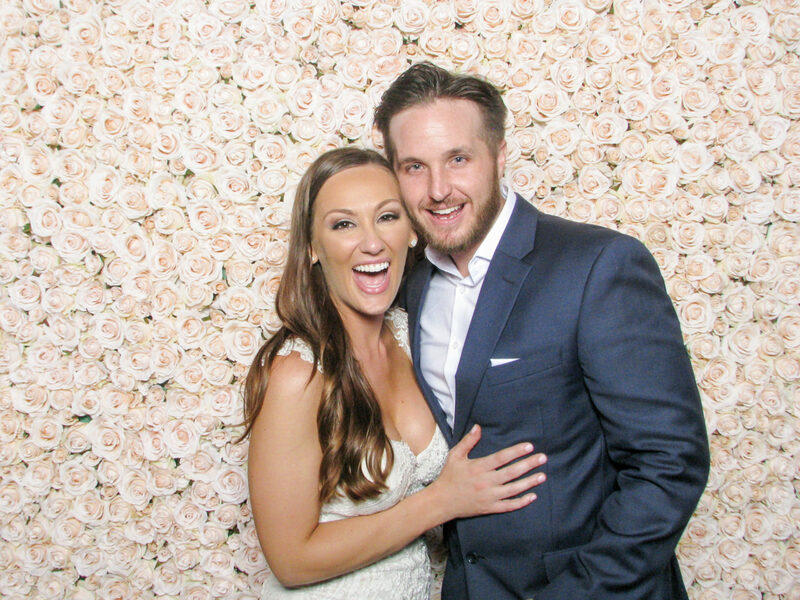 Our open air photo booths are totally customizable. We have lots of cool props to choose from that guests can play within the photos, like giant glasses, hats, or cut out speech bubbles with funny phrases. Each client also gets a custom design for the prints, including the couple’s name and wedding date. However, the star of Ashley and Michael’s photo booth was really the backdrop. The amazing florists at Sodenberg’s Floral and Gift made the backdrop out of dozens and dozens of white roses! It was gorgeous and fit the stylish formal wedding perfectly. The same roses were used for the centerpieces and head table garland. The whole place smelled amazing. Our photo booths can be really fun and relaxed but they can also be formal. This backdrop added a touch of class and taste to it. We love getting to be creative and finding designs that fit our client’s vision exactly. The wedding took place at the stunning A’Bulae event center in St. Paul. A’Bulae is a spacious, stunning venue with lots of awesome features designed specifically for weddings. They have various beautiful spaces that could fit any type of wedding ceremony or reception. They also have specialized services, like suites for the bride and groom, excellent catering, and even a refrigerated storage room for floral arrangements. If you’re interested in a photo-booth for your wedding, contact us. We’re excited to hear from you!